Gujarat is always seen as the land of food and culture. Our fafdas and garba have taken the entire world on a ride. Very few know that Gujarati theatre and its plays are equally entertaining and interesting. You may have watched and loved these films, we show you the original version and inspiration behind these films. If you don’t believe us have look at these films that adapted Gujarati plays into films. Very few know that this Amitabh Bachchan, Akshay Kumar, Priyanka Chopra and Shefali Chaya starrer film was actually inspired from the Gujarati play ‘Aavjo Vhala Fari Malishu’. The lay was produced by Hats off Productions and was quite well acclaimed. Later, bollywood director/ producer Vipul Shah found his story in the play and adapted it into a film. The film performed averagely at the box-office. It is no news that OMG was adapted from the popular Gujarati play Kanji Viruddh Kanji. The play gained a lot of popularity in theatre and was immediately adapted into a film starring Akshay Kumar and Paresh Rawal in leading roles. The film was a blockbuster and managed to question and change mentalities towards the concept of religion and blind beliefs. Reports suggest that Akshay is already planning a second instalment of this super hit film! This one released just a few months back and bombed at the box office. What most people don’t know is that the story was adapted from the Gujarati drama named Baa ae Maari Boundary. The story is about a lady who spends her entire life serving her family and is never valued. She is rather ridiculed and insulted until her grandson returns from the U.S and changes things for her. The film was loaded with melodrama and wasn’t accepted by the audience in spite of the fact that it had actors like Rekha, Randhir Kapoor and Sharman Joshi in lead roles. The thriller starring an ensemble cast of Amitabh Bachchan, Akshay Kumar, Paresh Rawal, Arjun Rampal and Sushmita Sen is based on the Gujarati play titled Andhlo Pato (Blindman’s Buff). This was director Vipul Shah’s first film and he did a swell job at it. The story of three blind men being trained to rob a bank came as a breath of fresh air for the audience and did well at the box office. 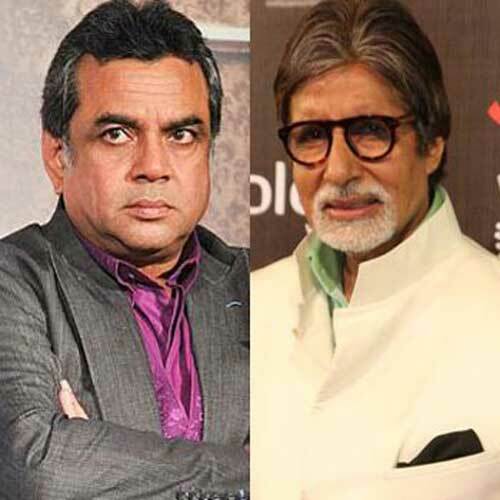 This is an upcoming bollywood film starring Amitabh Bachchan and Paresh Rawal. The film is going to be directed by Umesh Shukla who was also the director of OMG! The story is about a man who is 102 years old and his son who is 75 years old. The film is expected to release in late 2015. The film is adapted from the Gujarati play with the same title. A lot of anticipation is already in the air for this one. Do you know of any more films inspired from Gujarati theatre? Next articleDIRTY POLITICS REVIEW: A LOT OF MUCK!